A simple open platform inscribed with the Mahatma's last words, 'Hey Ram' (Oh God) is set in a garden with fountains and a variety of exotic trees. Raj Ghat, the cremation site of Mahatma Gandhi is one of the most visited sites in Delhi. It consists of a simple square black-marble platform that stands on the spot where Mahatma Gandhi was cremated. 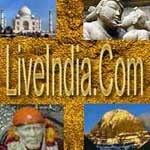 Nearby, there are cremation sites of Jawaharlal Nehru - the first Prime Minister of India, Indira Gandhi, Sanjay Gandhi, Rajiv Gandhi and Lal Bahadur Shastri. Raj Ghat is situated to the south of Red Fort and is very peaceful. 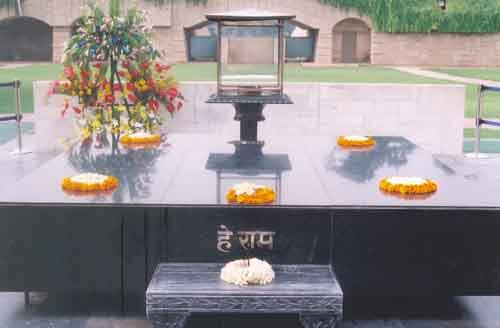 The black marble tomb is inscribed by the words 'Hey Ram! ', the last words that were spoken by Mahatma Gandhi, as he fell down after being shot by Nathuram Godse. The whole edifice of the Samadhi reflects the simple and nature-loving personality of the great leader. The cenotaph stands surrounded by earthworks that protect it from the flooding of the Yamuna. These walls have resulted in the open space of the memorial being converted into an enclosed garden. It is customary to circumambulate the tomb three times. The powerful spiritual aura of the place touches one's heart. This national shrine has an eternal flame and the sandstone walls enclosing it are inscribed with various passages written by Gandhi. The entire area of Rajghat stands surrounded by trees and here, one can see some of the most exotic shrubs of the country. This greenery is what lends such a serene aura to the Samadhi. The affairs of the Rajghat are being managed by an autonomous statutory body. It is known by the name of Rajghat Samadhi Committee and was created by an Act of Parliament in 1951. One can also visit the National Gandhi Museum in the vicinity, which houses a collection of rare photographs and trivia related to Gandhiji. Vijay Ghat is the memorial of Prime Minister Lal Bhadur Shastri, while Indira Gandhi was cremated in Shakti Sthal. Rajeev Gandhi followed his mother's footsteps and was the most beloved Prime Minister of India, when he was slaughtered in a terrorist attack. He was cremated at the Veer Bhoomi.